Green = Campsite, White = Main Roads on Property, Black lines are the 500 or so acres and the Yellow is the additional 300 or so acres. 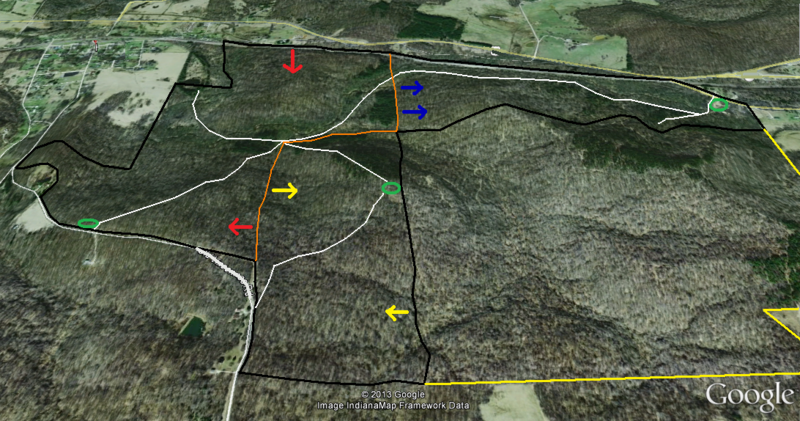 Here is 440 acres of awesome land split into 3 hunting camps. The biggest track I have seen on any property was filmed here. Gently rolling hills with a nice mix of timber and a major creek system. There are plenty of logging roads in good shape. Each section has its own campsite that is camper ready (no power/water on site).